Kelvin diesel engines are used to power fishing vessels, work boats, barges, tugs, coasters, ferries, trawlers, and inland tankers. Kelvin engines gearboxes and associated equipment supplied in propulsion packages. 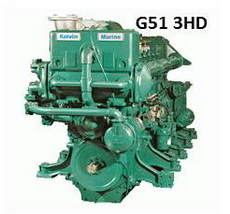 KELVIN MARINE DIESEL ENGINE and PROPULSION PACKAGE types and characteristics.